If you are looking for a book that is fun and easy to read, as well as tells a great story filled with everything from laughs to useable information while actually hiking the Appalachian Trail, then this is your book! Many people have written books on their AT thru hike, and this is Dennis’ hike, and it should not be missed! For anyone that is familiar with thru-hiker lingo, then you can probably figure out what the title stands for. But for those that don’t, a Zero is a day in which a thru-hiker does not hike, for one reason or another. Usually a hiker will come to a town and decide to hang out for a day to recuperate, wash clothes, eat at restaurants, sleep in a bed and to resupply. How many times a hiker decides to do this all depends on the hikers needs, and usually on monies allotted for the hike. According to the title of this book, Dennis took 300 Zeroes, but it wasn’t to resupply. Dennis tells his story of hiking the trail, literally straight from the heart. He has a way with words, which flow from page to page, making it hard to put down. Dennis weaves his trail stories just as the trail itself weaves its way through the mountains. Simply put, Three Hundred Zeroes has it all. It will definitely make you laugh and smile, and while I never cried during the reading, it did have its moments of concern. I would definitely recommend this book to anyone which plans to hike the trail, or even for those which have already hiked the trail. But wait, that’s not all! Dennis has written this book in such a manner that it would make an enjoyable read for anyone (not just hikers). So, be sure to add this book to your list and pick it up. You can even go to Dennis’ site, Three Hundred Zeroes, and order a signed copy. 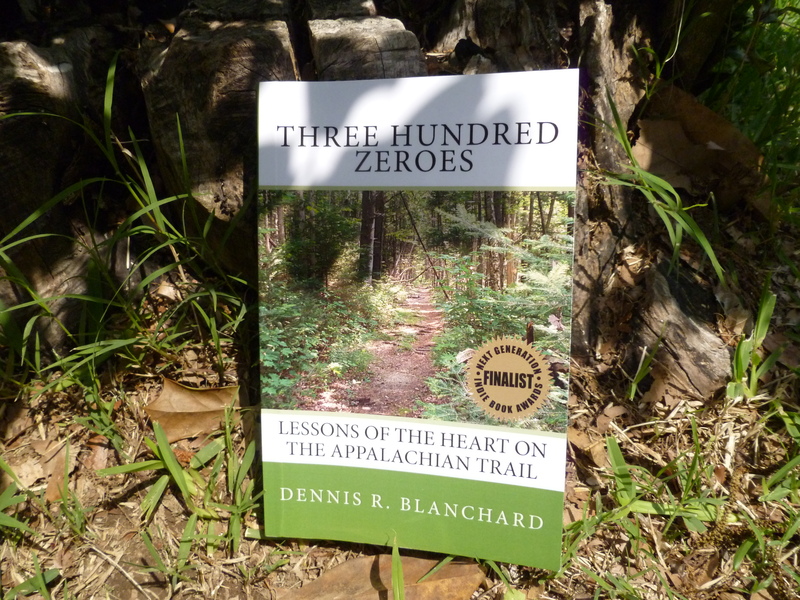 This entry was posted in Books and tagged Appalachian Trail, Appalachian Trail Books, Dennis Blanchard, Three Hundred Zeroes, Thru Hiking, Thru-Hiking books. Bookmark the permalink. Thank you Sticks for a warm and thoughtful review. Judging by the photo, you found the book growing wild in the woods? I never planned to be an author, but so many encouraged me along the way to tell the story and I just couldn’t disappoint them. The reception for the book has been stunning, I never realized just how many people relish going into the outdoors with a pack on their back and a song in their head. There are now thousands reading the book, both in print and on ebook devices, such as the Kindle and much of that success is due to readers like yourself. I don’t know if this story will inspire more to tackle the Appalachian Trail, or frighten them away from it? In any case, thanks for a wonderful site and keep up the fantastic work, you really do a nice review. Thanks so much for stopping by and commenting! I really did enjoy your book, and I appreciate you taking the time to record it and to publish it for the rest of us. I am planning a thru in 2013 and I am eating up these kinds of books, and I must say, I thoroughly enjoyed yours! I must say I found myself laughing out loud when I read through the part with the bear and the shower… 🙂 Great stuff! I just finished up reading this book about 2 weeks ago. Very good read indeed! I agree, his writing style flows easily and it was definitely hard to put down. I also appreciate the review you did of Just Passin’ Thru by Winton Porter. It lead me to another great book on hiking the AT. Hiking the AT is a long term goal for myself, but I could see myself in the near future trying to hike the 30 miles from Springer Mountain to Mountain Crossings. I’m in Tennessee so its not to far from home. Anyway, like your blog..keep the reviews coming! Thanks for checking out my blog and leaving a comment. If you haven’t already read AWOL on the Appalachian Trail by David Miller you should definitely check that one out too. The book I am about to read is On The Beaten Path by Robert Rubin. looking forward to getting this one going!